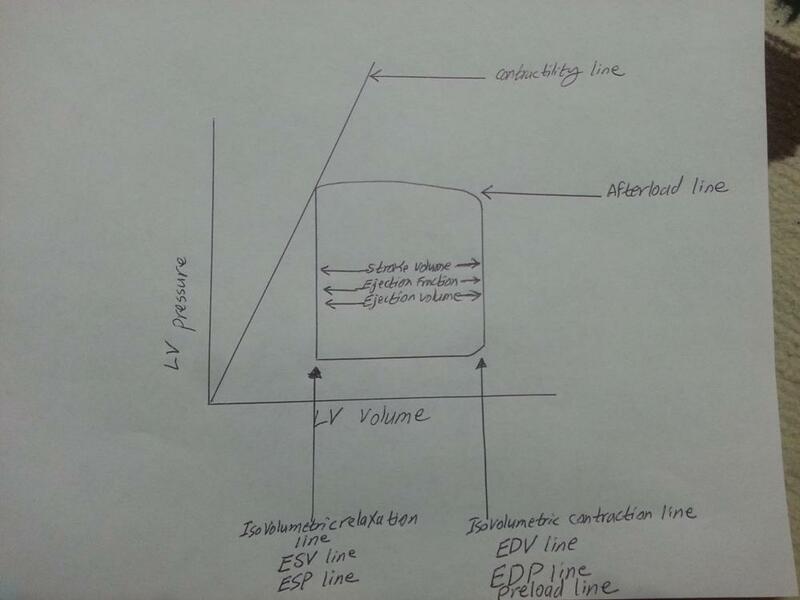 If you want to get every single question on LV pressure-volume loops correct, then follow this. First we have to start by familiarizing ourselves with terminology. Also, learning different ways of saying the same thing (for example, "increased stroke volume" is the same as saying "increased ejection fraction" and both of these are the same as saying "increased ejection volume"). ( Note that I am not saying these terms are the same, what I am saying is the "line" that represents them on a pressure-volume loop is the same. We use this "line" to determine whether an increase, a decrease, or no change has happened in EDV, EDP, Preload, but for Isovolumetric Contraction we don't care about it because it is not important, but the reason I am mentioning it here is because the line of the Isovolumetric Contraction is a "reference point" that we use to determine if a change has happened in EDV, EDP, and Preload. 3- Isovolumetric Relaxation line = ESV line= ESP line BUT NOT "Afterload line"
( Again notice that I am not saying these terms are the same, what I am saying is the "line" that represents them on a pressure-volume loop is the same. We use this "line" to determine whether an increase, a decrease, or no change has happened in ESV, ESP but for Isovolumetric relaxation itself we don't care about it because it is not important, but the reason I am mentioning it here is because the line of the Isovolumetric Relaxation is a "reference point" that we use to determine if a change has happened in ESV, ESP, BUT NOT "Afterload". Note that in this part I did not talk about "afterload" because "afterload" has nothing to do with the vertical line of Isovolumetric Relaxation. 4- The line to use as a reference point for determining changes in "afterload" is shown on the atached picture. OK this is the first part of this post. In my next post I will show how to determine if there is a change in "preload", "afterload", "cardiac contractility" and all the things that go with them. Also, if you are doing questions "UWorld, Kaplan, First Aid", use these reference lines and see how much easier you understand when they explain the answer choices.